Woofgang Rescue Receives Donation | Hupy and Abraham, S.C. The end of 2016 also brought the end to Hupy and Abraham, S.C.’s inaugural “Bucks for Charity” community contest. Throughout December 2016, members of the community were invited to nominate an organization of their choice. The nominated groups were put into a poll, and the public voted for who would win a donation from the firm. Over 50 nonprofits and organizations from Wisconsin, Illinois and Iowa were nominated, and more than eight thousand votes were made by the community. The 2016 “Bucks for Charity” winner was Woofgang Rescue, a dog rescue organization that provides services in several states. Woofgang Rescue is dedicated to saving dogs in difficult situations by assisting and selecting appropriate and safe new homes for them. Jodie Hoffman, Executive Director of Woofgang Rescue, was able to meet with Attorney Jason Abraham and receive the donation. Hupy and Abraham, S.C.’s $1,500 gift will allow Woofgang Rescue to purchase new grooming equipment for incoming dogs. In 2017, spread love and support for your community all year round. 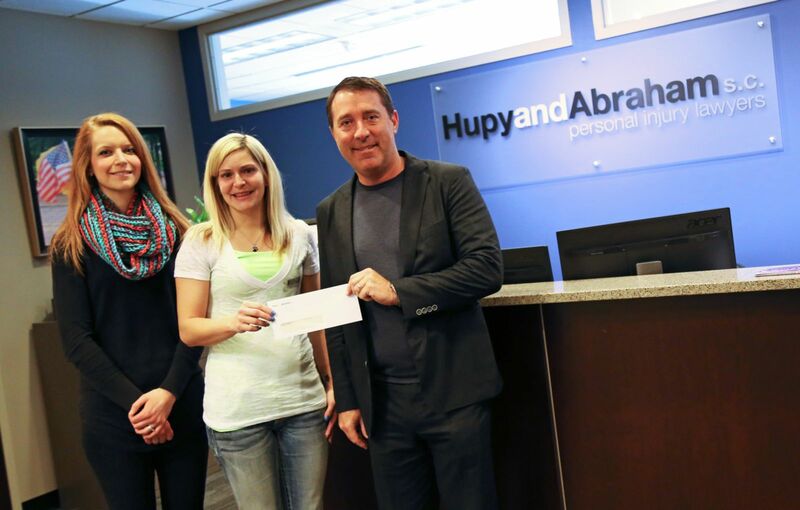 Hupy and Abraham, S.C. has been dedicated to helping our local communities for decades, by doing well by doing good. We hope that everyone has a safe and prosperous 2017!